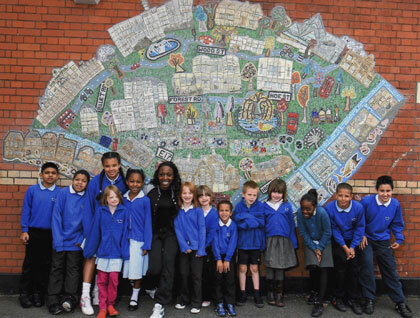 Click HERE or on the photo to see online article in Waltham Forest Guardian about the launch of this project with athlete Jeanette Kwakye! 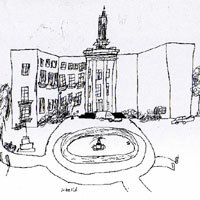 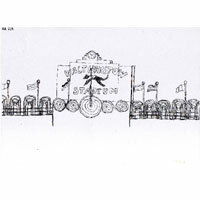 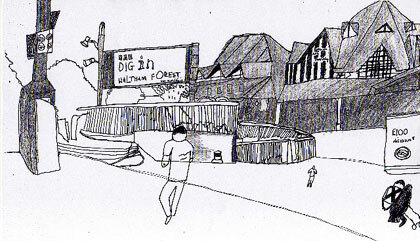 All pupils from Winns have been on trips with artist Alice Mara to draw the amazing historic buildings such as the Dog Track, The William Morris Gallery, the Old Cinema currently in the midst of dramatic public campaign to be saved (www.mcguffin.info), their school and homes and many other great places of interest. 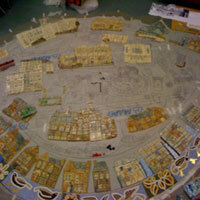 They have made ceramic tiles of the buildings, which will then be mosaiced around. 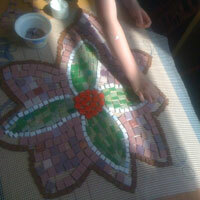 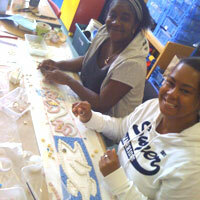 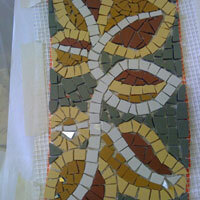 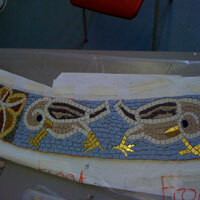 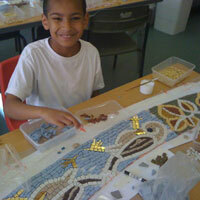 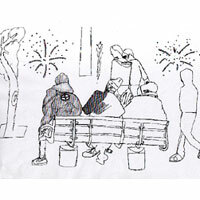 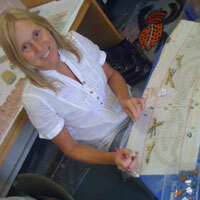 Thank you to all who came to the Open Studios at Trinity Buoy Wharf and took part in the mosaic William Morris border. 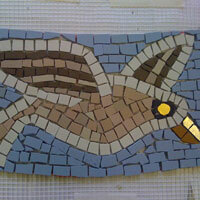 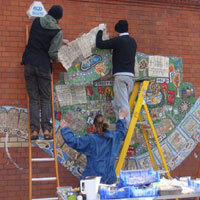 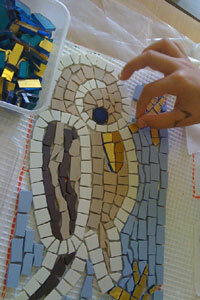 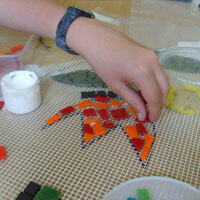 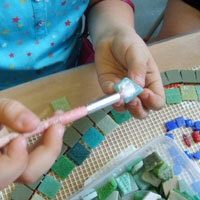 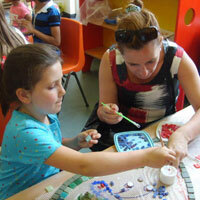 We had at least 100 people over the two days, glueing tiles for the birds, fish and foliage. 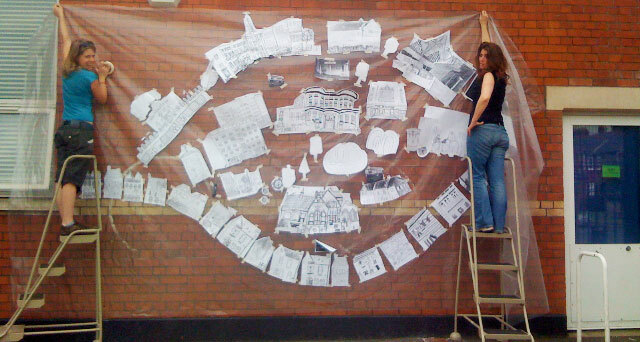 Full size design shown in situ. 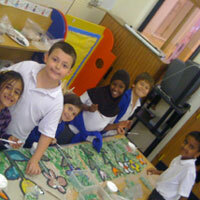 "We can't wait to see the mini-beasts go up in our playground as well as the main mural - you have all worked so hard!" 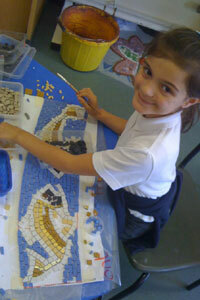 "Our children have learned so much and enjoyed creating something new which will be valued for years to come." 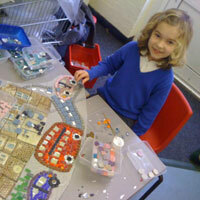 "On behalf of all the children in Year 1, THANKS so very much to all of you for the fantastic work you've done on our art project. 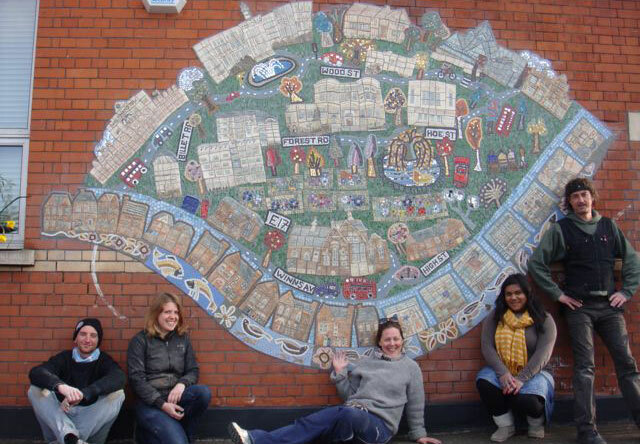 We've enjoyed working alongside you to create the beautiful mural. 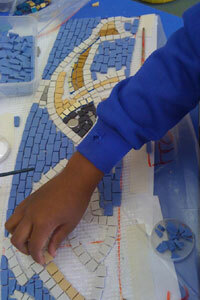 we can't wait to see the final result." 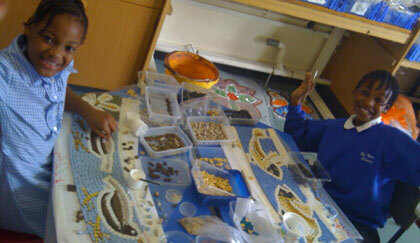 "The children loved being part of all the different stages." 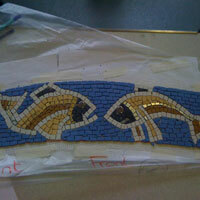 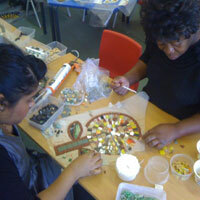 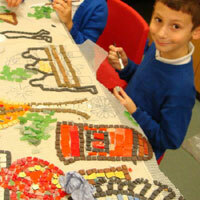 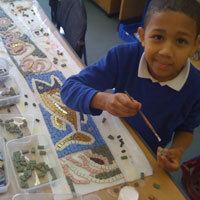 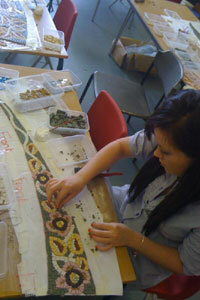 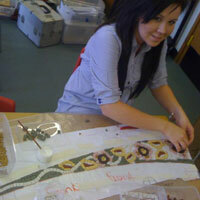 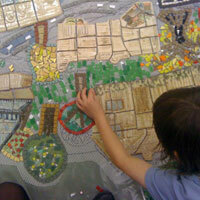 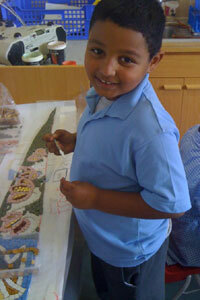 "The staff and children have loved working with you on the project and the end result is amazing!" 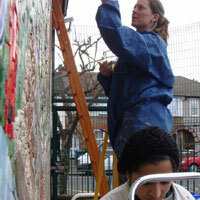 We had a fabulous two weeks finishing off the Winns Primary School in Walthamstow. 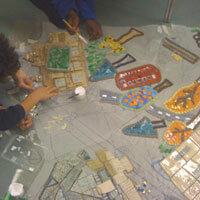 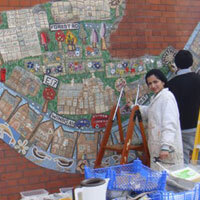 We put the pupil's hand-made, glaze-fired, ceramic tiles depicting Walthamstow's buildings and market stalls, into place. 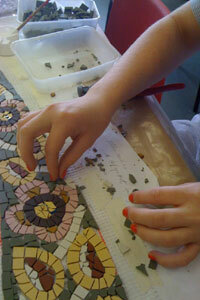 It was very rewarding and well worth the wait to see their drawings translated into the finished shiny ceramic tiles. 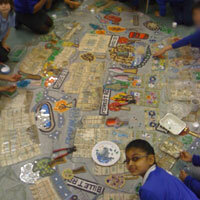 Pupils then mosaiced the roads, buses, people, trees and Lloyds Park around the hand-made tiles and it looks fabulous, we are just waiting for the weather to warm up so we can put it up! 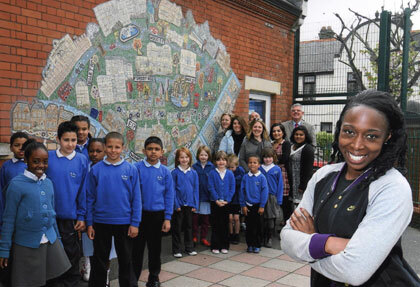 Athlete Jeanette Kwakye officially opens the mural along with Winns pupils who took part in the design and making. 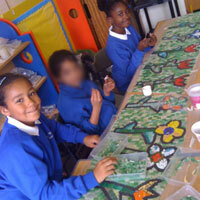 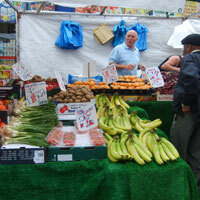 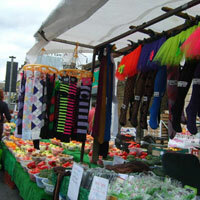 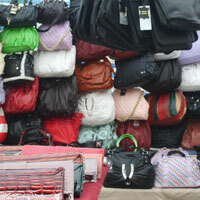 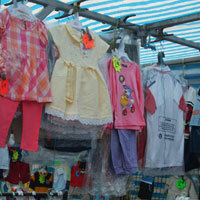 Click HERE to see online article in Waltham Forest Guardian covering the launch!